The second project in my photography course was shot way back in September in Munich. The purporse of this project was to shoot the same scene but focusing on different dimensions. This would concentrate attention on different parts of the photograph. 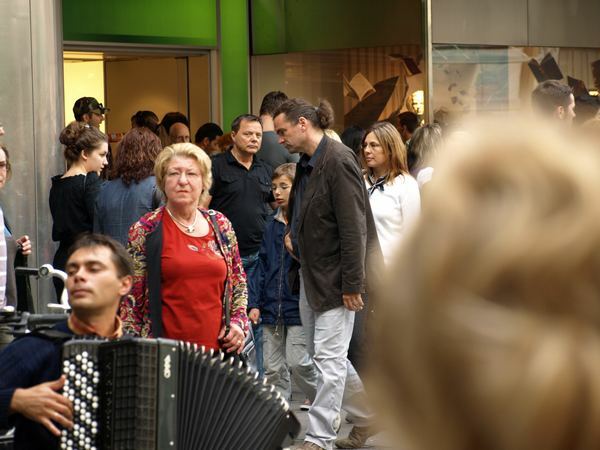 This first image focuses on the closest feature of the scene which was the back of a woman’s head as she watched a street band on Kaufingerstrasse. This photo is not that interesting as the background is too blurry and out of focus while the head is not so interesting from the back. This is the medium view where the focus is directed at the accordian players in the band. They back of the woman’s head is still visible but out of focus. It is still interesting that it is contained in the image as it gives the impression of a crowd watching the band. The furthest focus was taken after many attempts to find something interesting to focus on in the passing crowd behind the band. Here, a man comes out of the Kaufhof shop and seems to focus his attention past the band to the camera. This is probably unintentional and was a result of the luck of the shot. 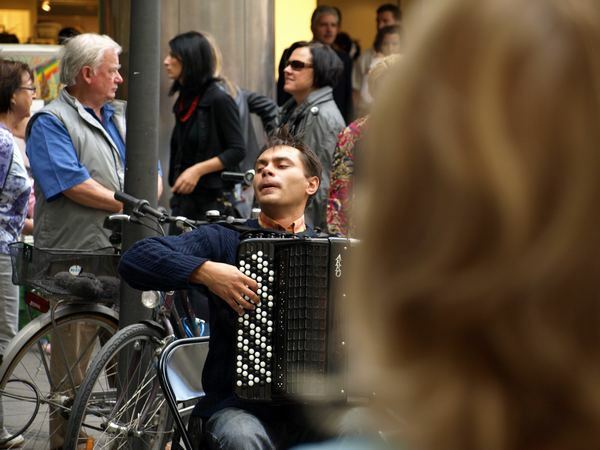 Here the accordian player is slightly out of focus but in a much more clear way that in the first photo. In my opinion, this is my preferred photo of the three.